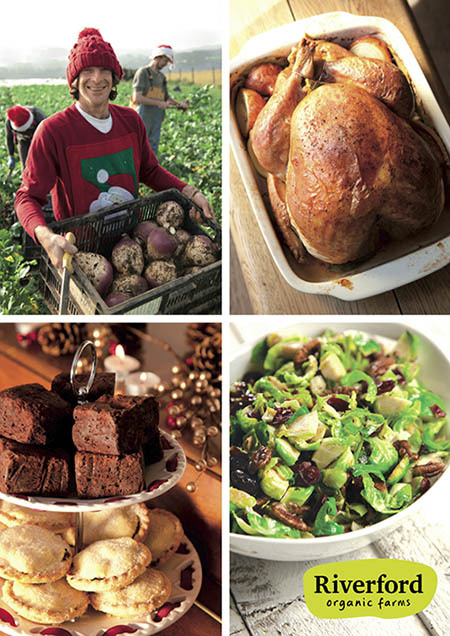 Riverford Christmas Fair and Festive Recipes! Our friends at Riverford are hosting a Christmas Fair on Saturday 30th November in London at Cecil Sharp House. There will be lots of festive fun with Christmas activities for both adults and kids: chili stringing, wine tasting from Ben Watson, founder Guy Watson’s brother, as well as cooking demo’s from Guy himself! Lots of scrummy festive dishes including caramel clementines. Enjoy trying it out yourself or go along and watch the expert in action! Caramel Clementines – serve this on it’s own or with ice cream or add a few toasted walnuts for a bit of crunch! In a saucepan, add the sugar and 5 tbsp water. Heat gently until the sugar has dissolved (do not allow to boil). Once sugar has dissolved, heat liquid to boiling point. Continue to boil until the liquid has reduced and turns a dark caramel colour. Carefully add 1 tbsp water (it will spit slightly at first), then add the rest of the water and stir well. Add the spice and a splash of booze if using. Pour over the fruit and leave to marinate for an hour before serving. If mince pies aren’t the favourites in your house, then Rocky Road normally ticks everyone’s boxes. Enjoy making Riverford’s festive take on Rocky Road – a nice one for the kiddies to make, box up and give as presents too! 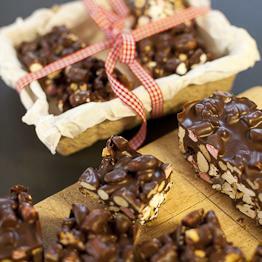 Festive Rocky Road – use good quality chocolate for this one, how about a mix of milk and dark for a rich but not bitter-tasting! Line a 4-5cm deep tin or dish approx 30cm x 20cm (or the nearest size you have) with baking parchment. Put all the ingredients except the chocolate into the tin, making sure it is all evenly distributed. Break up the chocolate into small pieces and place in a heatproof bowl that fits snugly over a pan of simmering water. Gently heat, without stirring, until the chocolate has melted. Stir briefly to combine the two chocolates, then pour evenly over the nut mixture. Leave to cool at room temperature, then refrigerate until firm (about 2 hours). Cut into small pieces using a sharp knife or pizza cutter. Keep in the fridge. Riverford and their producers will be showcasing all of their beautiful Christmas products at their Christmas Fair, including Riverford’s legendary mince pies! A great opportunity to get some of your Christmas shopping done early – see you there!